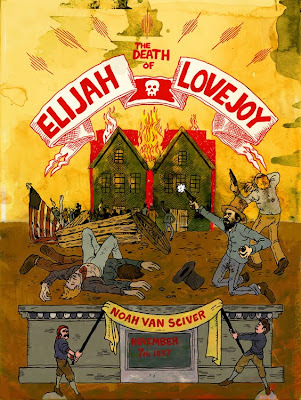 Noah Van Sciver's The Death of Elijah Lovejoy is his single strongest work to date, especially in terms of his art. Before I get to the content, let's discuss the design and presentation. The mini was published by Minneapolis' 2D Cloud, the folks behind the excellent Good Minnesotan minicomics anthology series and much of Nic Breutzman's output. Unsurprisingly, they put a lot of care into this comic, with publisher/editor Raighne Hogan supplying the lurid, vivid colors for the cover. 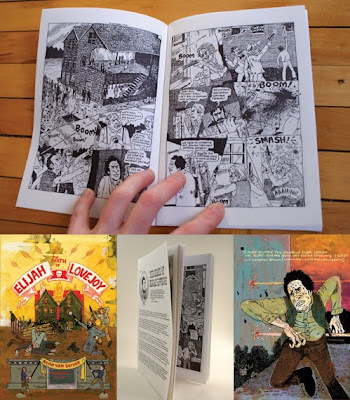 The comic was printed by La Mano, Zak Sally's own press. The quality of the paper and hand-made nature of the printing process make this a beautiful little art object. For an artist like Van Sciver, who does a lot of cross-hatching and employs a lot of thick blacks, the ink has an almost visceral quality on the page. I hope that more publishers turn to Sally for printing, given that comics are becoming more and more of a niche item; the tactile nature of the paper & ink provide value added that can't be matched by reading it on a digital device. With regard to the comic itself, Van Sciver is carving out an interesting niche doing historical fiction. His story about "The Denver Spider-Man" that appeared in Mome as well as the first chapter of his Joseph Smith story indicate an interest in obsessive and fanatical historical figures. In Van Sciver's hands, such a characterization is not necessarily a pejorative. The Death Of Elijah Lovejoy concerns a midwestern abolitionist in the 1830s who published a radical newspaper that denounced slavery from a moral (and explicitly Christian) standpoint. Lovejoy's editorials denouncing a lynching provoked local mobs to destroy three of his printing presses. The comic opens with a mob cornering Lovejoy and his publisher in a building that housed the press. 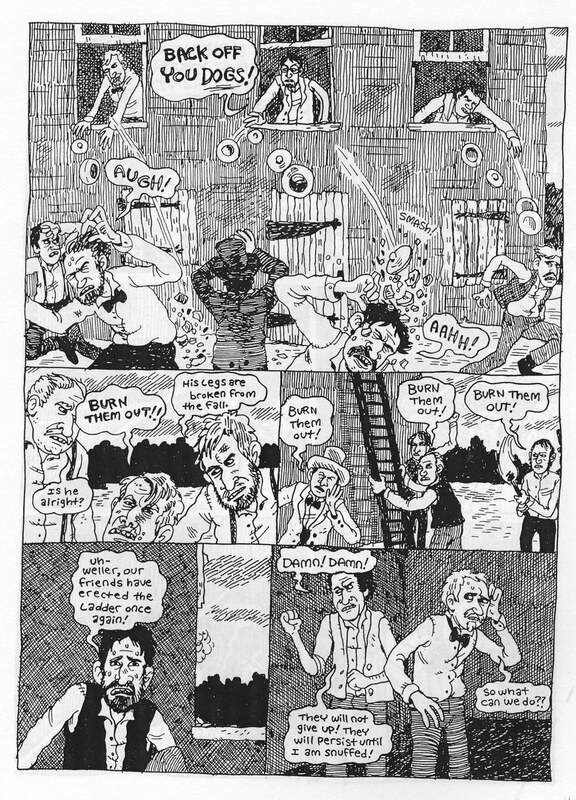 The rest of the comic is devoted to Lovejoy's failed defense of his press from a mob of thirty armed fanatics. 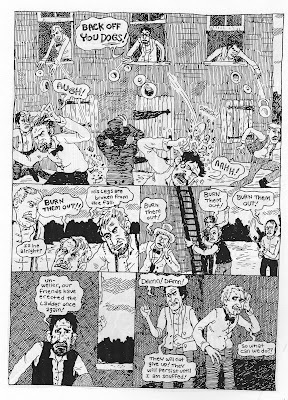 The manic intensity of Van Sciver's cross-hatching and the slightly grotesque quality of his figure work perfectly encapsulated the deranged quality of the mob and the desperate, upright defense of the Lovejoy & his friends. The comic is a procedural on how the staff defended themselves, improvising desperate plans on the spot that beat back the first wave of assassins before falling to the inevitable and chillingly bloodthirsty mandate of the mob. Again, it's the details and richness of the printing process that make the huge droplets of sweat and bloody smudges pop out on the page, depicting the shattering nature of the event in all its ugliness. Van Sciver notes that while Lovejoy was nearly helpless sacrificing his life for his beliefs and freedom of the press, his murder established him as a martyr for the abolitionist cause and was a key event in the run-up to the Civil War. The story and its ideas are simple, but Van Sciver brings it to life with his attention to detail, given the impeccable quality of the period dress, weapons, buildings and equipment. That's why the one flaw in this comic drove me crazy: Van Sciver's spelling errors. It's especially disappointing given that Van Sciver had an editor for this comic and that the comic was otherwise so painstaking in doing the little things right. That said, I hope to see Van Sciver continuing to work with 2D Cloud, because their care and attention make this the best-looking comic of his career. As Van Sciver's voice and line continue to grow in confidence, he deserves to be published in this kind of format. A whole lot of people could have spelled all of those words correctly, but only one person could have told that story so well and his name is Noah Van Sciver.